Team Europe ended the morning fourball session 3-1 down, but as the wind picked up on Friday afternoon they took advantage of their course experience to complete a 4-0 victory in foursomes for the first time in history. The momentum began early at Le Golf National for three of the four European pairings, and the key was impressive ball-striking and making birdies. Europe made a total of 13 birdies to the USA's 7, making just 9 bogeys to the USA's 19. Looking for inspiration after a disappointing loss on the final hole of the morning fourball matches with Jon Rahm, Bjorn decided to send out Justin Rose with his historically succesful partner Henrik Stenson in the first match, and they didn't disappoint. They got off to a slow start, going par-bogey-par-par and matching DJ and Rickie over those first four holes before getting on a run and moving to three-up after 7 - needing just one birdie in that stretch. Missed putts and fairways for DJ and Fowler saw them bogey the 10th and 11th holes and Rose and Stenson move to 5UP, and while they would win the next two in a row, three halved holes from the 14th gave Rose and Stenson the 3&2 victory and the first point of the session. "Henrik and I have had great vibes in this event," Rose said afterwards. "So to rekindle that was the perfect thing for me this afternoon. And Rory gave us -- he said to me, come on, put some blue on the board, give me something to chase or give me and Poulter something to chase." "It's always nice when you take down two players like Rickie and Dustin, but the whole American Team has some heavy players," Stenson added. "Every point is hard to get and we're just very delighted to get this one home." There were questions surrounding McIlroy and whether a disappointing morning left him deserving a place in the foursomes on Friday, but it turned out a pairing with Ian Poulter was exactly what he needed to find his form. It didn't look like it would go their way from the start, though. Watson and Simpson quickly pushed ahead, winning two of the first three holes to put the only red colours on the board. But it wouldn't last long. A momentum swing came at the 6th as Rory hit a huge drive and they converted for birdie, before winning the next three holes to peg back a 2-down defecit and turn it in to 2-Up, although it was helped by several missed putts from the American duo. Watson and Simpson would win the 11th, but they would lose the next with a bogey as McIlroy and Poulted moved back to 2UP. One of the most impressive hole wins of the day came from this group, as McIlroy found the green with his approach despite having to play from a downhill lie, standing on the side of the bank. With that they would be 3UP, and just three holes later Watson would conceed the match on the par-three 16th. 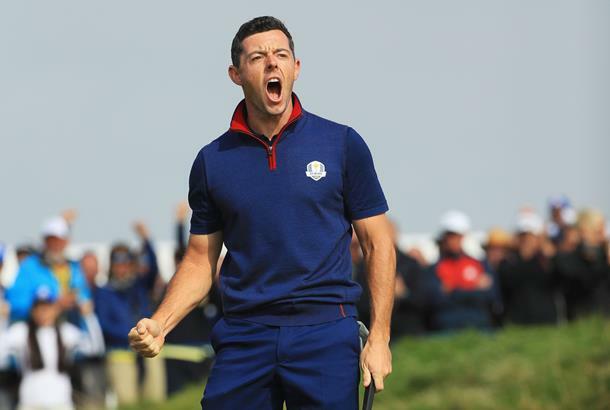 "It's hugely satisfying," Rory said of the win. "We were 2-down I guess through four or five or whatever it was, and you know, I held a nice putt on 6 for birdie and then we got going after that. It was a little bit -- we played solid golf and we made our pars in difficult conditions. The two guys struggled and missed a few fairways and we took advantage of them. "Incredible afternoon for Europe. One we haven't really had since Gleneagles, I guess. You know, there was a couple of times where we threatened to have a great session in Hazeltine that didn't really materialise, but to see all the blue on the board this afternoon is awesome." Garcia and Noren turned out to be the pairing of the afternoon as questions were left surrounding Mickelson's selection in the foursomes - having been left out of the fourball matches that arguably suit him better. Both Garcia and Mickelson were captain's picks, but it was the former who increased his Ryder Cup points tally on Friday afternoon with rookie Noren and left any questions surrounding his wildcard selection rendered mute. Following a halve at the first they raced in to the lead, proving an outstanding foursomes pairing as they put together five birdies in their next eight holes to get to 7UP by the turn. It was a mixture of big birdie putts that helped the pair move so quickly ahead, although DeChambeau and Mickelson did themselves no favours, finding themselves four over at the turn. Garcia and Noren slowed down a little, losing three of the next four holes but remaining in control as the American's were dormie five. The match ended on the par-five 14th, with both pairings halving the hole with a birdie. "I've got an amazing partner," Garcia said about Noren. "He played amazing. I think the front nine we played in foursomes on this course with the wind that was blowing was spectacular. It was something that I will never forget and I'm sure Alex won't, either." "It's historic. We swept the US and it hasn't happened before so it's obviously a great moment but it's just the first day. We have to make sure we stay ahead going into Sunday." "It was an unbelievable first day," Noren said of his Ryder Cup debut. "Yeah, I -- I'm so happy, just to get it out of the way, you know, get a good point and playing with Sergio is fantastic. Yeah, it means a lot to just be on the team and make a point." Francesco Molinari and Tommy Fleetwood rallied during the morning to grab the only point of the fourballs, and Thomas Bjorn decided to keep them together for the afternoon - a move that proved an inspired one as they took down Jordan Spieth and Justin Thomas 5&4 in the eighth match of the day. Spieth and Thomas had impressed in their morning match but couldn't find a rhythm in the afternoon, which was something Molinari and Fleetwood - both players with success on this course- had an abundance of. They first moved in to the lead with a birdie on the par-five 3rd, and by the sixth that lead was three. Spieth and Thomas would win the eighth with a par, but they would lose the next two with back-to-back bogeys before a win on the par-three 11th thanks to a Jordan Spieth tee shot converted into a birdie from Thomas. That would be the final hole the American's would win though. Fleetwood and Molinari won both 13 and 14 to finish the match 5&4 and put the final point on the board during an afternoon where Europe dominated the strong American side. "We enjoy playing together, and obviously spending time together," Molinari said of Fleetwood. "He's played amazing this morning and this afternoon. "I think we just combine really well. But you know, the boys that went out early this afternoon made an unbelievable job. Very, very different from this morning, the atmosphere, and we needed it."